In storytelling, there is a tendency to place too much emphasis on endings as indicators of quality. One of the chief criticisms of The Lord of the Rings: The Return of the King is that it's a film which ends four times before it actually finishes, and even the most ardent fans of Stephen King tend to agree that his books are great right until something dumb like a giant spider shows up in place of an actual finale. These might not invalidate the rest of the story being told, which could still be a hugely enjoyable, even beautiful experience up until that point (though if you found the preceding 9 hours of little people walking through lovely locations to be interminable, I can easily see why Return of the King's stuttering finale would be hellish) but since endings are what an audience takes away, they'll be the thing that they remember most clearly. This is why a perfect ending - one that not only resolves the plot but also the thematic and emotional undercurrents - is so rare. Endings are hard to get right, and that's why most films do well if they can end in a way which is merely okay, rather than one which sours the whole experience. Pixar's Monsters, Inc., which gets a 3D re-release this week, boasts one such perfect ending, and possibly the best ending from a company who have shown a preternatural knack for knowing exactly how to end their stories. It's so perfect, that when it was announced that a prequel was in the works, I almost jumped for joy, despite my keen awareness of how utterly terrible prequels tend to be. As long as Pixar weren't going to mar the ending of Monsters, Inc. by showing what happened afterwards, they could do anything they liked. But a great ending requires a good set-up. A film could have the most transcendentally beautiful/hilarious/terrifying final five minutes, but it would all be for naught if the audience walked out during the first 85. 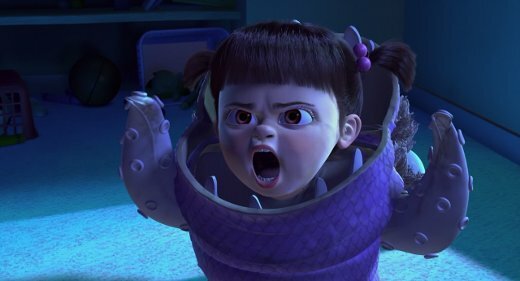 To that end, Monsters, Inc. has one of the simplest, most effective premises imaginable: what if there really are monsters in the closet, and what if scaring children was their job? It's essentially the same basic idea behind Toy Story - taking a common childhood theory of how the world works and running with it - though Monsters, Inc. was the first film to demonstrate the kind of scope that Pixar were capable of, creating an entire universe accessible through plain, unassuming doors in everyday homes (which, incidentally, doubles as a potent metaphor for the magic of art). Through those doors live Sulley (John Goodman) and Mike (Billy Crystal), a team of Scarers who work for the titular corporation. Their job is to go into children's bedrooms at night and scare them, then collect their screams, which in turn are converted into power for the people of Monstropolis. Sulley is especially good at his job, having become the top Scarer despite the best efforts of his main rival, Randall (Steve Buscemi), who has resorted to going in after hours and using the special doors connecting Monstropolis to the human world to boost his numbers. Sulley discovers this when he happens across a still active door, as well as the child it belongs to. Believing, as all monsters do, that children are deadly and exposure to them could be fatal, Sulley freaks out, but winds up taking the child, who he names Boo (Mary Gibbs) after the door gets deactivated and sent away, stranding Boo with Sulley. This sets in motion one of Pixar's funniest films, as Sulley and Mike try to hide Boo whilst also being deathly afraid of coming into contact with her, setting up some great sight gags of two weird-looking monsters being utterly terrified of a small girl acting adorable. There are also moments when it becomes darker and creepier than a lot of their other films, particularly once it is revealed that the head of the company (James Coburn) has constructed a machine that forcibly extracts screams from children, then comes perilously close to trying it out on Boo, to the horror of Sulley. It's a film of many tones, all of which it balances beautifully, from farce to fear, right up until the giddy adventure of its final set piece, in which Mike and Sulley are chased through dozens of doors in the gargantuan area where they are stored, diving in and out of different rooms as they try to escape Randall. It's an almost literal rollercoaster ride that pushes the basic premise of the film further than might have otherwise been thought possible. It's the contrast with the exhilaration of the chase that makes the final moments of the film so affecting. Having thwarted the villainous plot and defeated the bad guys, Sulley is told that Boo's door will be destroyed so that they will never have to worry about her stumbling into their world again. Having grown attached to her, Sulley now has to say goodbye forever. Except that isn't quite how things turn out. After a farewell that is all the sadder because only one of them understands that it is a farewell, Pixar does a remarkable reversal, one which somehow doesn't feel fake or forced. The film jumps forward to a point in time where Sulley has taken over the company and changed it; instead of capturing screams, the monsters now capture laughter, which is a much more powerful energy source anyway. Yet despite his success, Sulley still misses the little girl who called him Kitty. That's when Mike surprises him with Boo's reconstructed door, missing only the final piece, which Sulley keeps as a souvenir. Sulley walks through the door and, in a moment that is just heartbreaking, we see the joy slowly spread over his face as he sees Boo and hears her voice. It's a rare example of a happy ending that actually feels earned, largely because the separation is so sad, and the reunion is not really depicted. It's underplayed just enough, and doesn't ladle on the emotion because the filmmakers trust that we will know how it'll turn out. We don't need to see it, and that's why it's great.